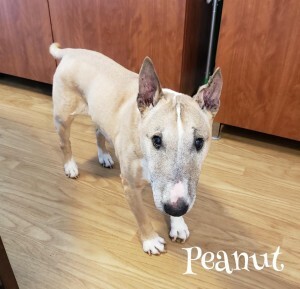 Peanut – Rocklin, CA | Bull Terrier Rescue, Inc. This super sweet 12yo girl needs a new home as her owner has escalating medical issues and can no longer take care of this little doll. Peanut loves children (including infants), other dogs, is good with chickens and has been curious about the neighbors’ cats when they land in her yard. Her eyes are good, her teeth were just cleaned four months months ago and her blood work levels were all normal. She’s never been in a crate but she is obedience, house and leash trained. A delightful 40lb older girl! If you’re interested in this little muffin, please complete our online application: http://www.bullterrierrescue.org/?page_id=572. This entry was posted in Available Dogs, Available Females, Available Seniors by Susi Ming. Bookmark the permalink.